Package includes: -1 x Expandable garden hose -2 x US Standard Connector -1 x Shut off valve -2 x Rubber washers Tips for use: Note that the optimum temperature for using a hose is -22℉to 122℉ To ensure that the water pressure in the normal range (58-87 psi) Always turn off the water when not in use store the flexible water hose in the shade or keep it covered Do not step on the water pipe when it is inflated Warranty: 12 MONTH WARRANTY! for Any Manufacturing Defect just Contact Seller for any claims. Super Efficient Expansion: inGarden designed expandable hose is an ideal choice expanding hose that meet your diverse watering needs. Extra Long and Portable: A Perfect Length to Reach Every Watering Destination.Very lightweight so you can freely take it anywhere for use. Inner rubber washer and Aluminum buckle, no more leaks or cracks! Durable Materials: Double layer 100% natural latex core, extra durable latex core and High-strength elastic outer fabric with No break,No cracking,No leakage,No rust,and No corrosion. 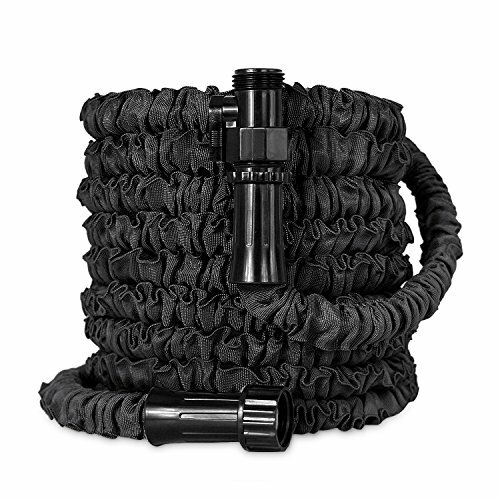 Make Life Easier: This tangle-free expandable hose will never twist, or kink, flexible and easy to handle and to storage! The hose can expand up to 3 times of its original length and shrink to its original length for easy storage. More Long-lasting: This hose is great for many watering and cleaning uses: garden,lawn,car-washing shop,etc.Suitable for most spray nozzle attachments.12 Months Warranty,feel free to purchase from inGarden Brand.It will be better than the one you once owned.